It is now officially mid-winter, with today being the winter solstice, marking the shortest day of the year in the southern hemisphere. Also marking the mid-winter in Hobart is the mid-winter festival of Dark Mofo. Dark Mofo is an annual event held in Hobart, specifically for the discerning bearded male who prefers to indulge in old arts of pork pulling and consuming alcohol brewed in very small batches. More on Dark Mofo later, what I really want to talk about is garlic. If you haven’t already planted yours, get planting, I have identified in the past, noticeably smaller bulbs on plants that have been planted even just a couple of weeks after the solstice. What I prefer to plant is the already sprouted cloves from the previous years crop, these should already be sprouting, if they are not, or if you do not have enough, then, rubbing your finger over the pointy top of the clove may allow you to feel a bump where the shoot is forming. I prefer to plant with skin on, I don’t know if it makes a difference at all, but, it feels like there would be less chance of attack on the cloves from mold or fungus etc. I plant the clove leaving the very top of the clove and the shoot exposed. I normally lime then soil a touch as I hear they appreciate it. Planted like this, all you really need to do between now and harvest is weed a few times, and maybe water a touch when it warms up a bit. If you don’t have a crop from last year to replant, head to your local green grocer or, I guess now days, the other dwelling place of the bearded male, the farmer’s market. If the garlic is untreated local garlic, you should be able to find bulbs with cloves sprouting to pop in the ground. Pest wise, I have never had any. I did though, find weird aphid things on some of my shooting cloves. These do not seem have had any effect on the cloves and were perhaps trying unsuccessfully to feed on the new shoots. I do not imagine that they will be an issue on the growing plant. I must admit, my technique goes against advice that I have read, recommending not to plant already sprouted cloves. The advice that I give has worked great for me and provided predictably large plump cloves each year. How can I get good head? … On my Broccoli? You really need to get your mind out of the gutter. My Broccoli, although always great tasting and more than suitable for stir-fry, never seems to form a nice, firm head (there you go again). Any advice as to how to achieve this, please comment and share your secrets. The other issue that I have during the cooler months with my brassicas, especially Broccoli, is Grey Aphids. These make eating the Broccoli borderline impossible at times as, no matter how well I wash them, I always seem to miss some. Any advice on eradicating this pest would also be much appreciated. 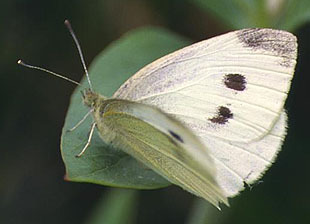 The other pest that is the bane of the brassica grower is the caterpillar of the Cabbage White Butterfly. The butterfly lays little yellow eggs on the underside of your brassica leaves, which, can be manually wiped off, only to reappear soon afterwards. Left untreated, the caterpillars can likely destroy young seedlings, making less of an impact on older plants. The product that I have been recommended for control is Dipel. Dipel contains a bacteria which, when consumed, kills the caterpillars. I am led to believe that it has less environmental impact that other products used to control the larvae, and, I have used it myself, seemingly with good results, if I can remember to apply regularly as per packet instructions. While on the topic of brassicas… I have never really tried to grow much in the way of cabbages, due to perceived space requirements, and, actual space restrictions in our previous garden. After seeing my Father-in-Laws great results, I decided to give them a go. This is one head that I am proud to show off. Hopefully, this post with all of its innuendo (which is all in your filthy mind) should do wonders for my search engine optimisation. “Fartichokes, what is going on here? This isn’t the normal, high brow, sophisticated humour that we have come to expect from the Hobart Backyard Farmer”. The fact is, I just cannot speak about this recent harvest without going there. Those of you in the know (it is nothing to be proud of) will know that I am talking about Jerusalem Artichokes (Helianthus tuberosus). I will leave it to your imagination as to how the tuber earned it’s name, but, let me just warn you that is is best eaten with your loved ones in the privacy of your own home, and, would not make a great 1st date meal. O.K. Now that I have your attention, let me tell you that this is a tasty vegetable, related to the sun flower, which provides good sized crops, with little care. I have heard that it is weedy like a potato, with new plants sprouting from bits of left over tuber. I cannot recall when I planted mine (this is my 1st crop) but Peter Cundall’s Tasmanian planting guide says to plant in June. I planted in a fairly shallow bed, about 1.5 x 1 metre (maybe not even that), and harvested a large plant pot full. I only watered when I saw noticeable drooping of leaves, which was probably only 3 or 4 times over summer. I imagine, if grown in a well cultivated and well watered bed, harvests would be much greater, only, you would have no friends. Harvest is easy, just lift the plant up a bit with a spade, and then lift plant to expose the well formed tuberous base. Tubers detach easily, and soil is easily brushed away. I have stored these in the fridge, I reckon for months without any spoilage. I usually roast, but, I am led to believe that Jerusalem Artichokes can be cooked in a variety of ways. How do you cook your Jerusalem Artichokes? People are never asking me what I do to compost kitchen waste. We have always toyed with the idea of getting chickens, one of the great kitchen waste consumers, but, have yet to take the plunge. Hopefully this spring will be the time, and we can finally be self respecting gardeners. So, what do we do with the kitchen scraps? We keep a 20 Litre bucket in the kitchen which we place all of our organic waste (vegie peelings, fruit pits, uneaten food (not meat, citrus or much dairy) and some paper products.) If I happen to be digging over a new bed, I will dig a big trench in the centre, and chuck the bucket of waste in, spread it out, and back fill. This benefits the soil by building up the organic material, and attracts earthworms to feed. The major composting that we currently do though, is with worm farms, utilising composting worms. We have 2, multi-tier farms, which live in the shade of the fernery. I honestly can not believe how effective the worms are at consuming waste. We fill a 20 Litre bucket probably every 1.5 – 2 weeks with food scraps, and by the time that we empty into the worm farms, the previous bucket has been entirely consumed. Do I use the castings and worm juice on the garden? Well, firstly, I am a lazy gardener. Why am I admitting this? Why am I building this anticipation unnecessarily? Basically, I found that A. I was producing more worm juice that I cared to water the garden with, B. I found that my lack of releasing the juice, would cause a build up in the farms which would go stanky, and cause worm drownings. Due to this, I just keep the taps open. The castings? I have used these a couple of times, and, I long to be fully utilising the castings in the garden… my problem, removing the worms. On the odd occasion that I thought, “this is it, im going to get those castings”, I have begun the task, and very soon given up on the incredibly slow and unrewarding task. These multi-tier worm farms go on the theory that worms tend to migrate to the top tray where all of the fresh food is made available. In my experience, yes, the top tray is laden with worms, but, the under trays still contain far more worms than I wish to sort. A solution? I have been pondering the possibility of taking 2 buckets which can slot into each other, the top one with holes drilled into the bottom. The bottom bucket would have the castings added, then, flooded with water. The theory being that the worms would migrate to the second bucket (i guess with a portion of casting, or bedding material) leaving the bottom bucket filled with wormless castings for the garden. Has anyone else got any secrets to separating the worms from the castings? Worms will eat just about anything, food scraps, hair, tea bags, coffee grounds, cardboard, paper, and, I am told, vacuum cleaner dust. I have been told never to feed worms citrus, as it will kill them. I have done so in the past, and did not notice any impact on the population, I did however notice, long after feeding the citrus, that a strong citrus smell lingered in the trays. Feeding meat may attract flies etc. Although, I am told by a man that I once bought worms from, that they love fish. I prefer to bury my fish directly into the garden personally. All sorts of other bugs will move into the worm farm. I leave them be, they do not seem to harm the worms, and I assume, contribute to the composting. Keep the trays moist, but not wet. I have found that I have not really needed to add water (although I do when I rinse the bucket. I empty the bucket, chuck some dry leaves over the food, then pour the water, post rinse, over the top. That is pretty much it, if you are short on space and do not wish to see your food scraps going into the bin, I recommend worm farms as a low maintenance, feel good solution. Below, some pics. For some reason, I was unable to achieve a blur-less pic of the worms, but, you get the gist. As promised, I am using this post to let you in on a couple of my heirloom vegetables that I have been growing in recent years that believe to be superior in their characteristics. One is the impossible to pronounce (even if you sit down and actually try) Wapsipinicon Peach Tomato, the other is a Zucchini with an almost equally challenging name, Costata Romanesco. Predate a period in time – It seems that some consider age of the variety to be of importance, pre-1950’s or pre-WW2 are a couple of examples that I have seen. There is a number of arguments that people use to promote the benefits of heirloom vegetables. For me, I grow a mix of hybrid and heirloom crops (hybrid meaning that parents have been selectively cross pollinated in order to produce seed and subsequent fruit of a particular quality). I have found some great heirloom varieties, but also, quite enjoy the super sweet hybrid corns and have had better success with a hybrid pak choi variety over heirloom varieties that I have grown. Now, there is something else to consider when thinking about heirloom vegetables, that consideration being, food crop diversity. This is not the segway into a hippy rant, as, since acknowledging in my early 20’s that I was never going to do anything to change the ways of the world… I have become somewhat and perhaps sadly indifferent to sick sad world (Daria reference) around me. I did however read an article in a magazine not too long ago, the topic being, the massive decrease in food crop diversity. I do not know where the original article is in order to quote, but the below link has a great graphic derived from a 1983 study illustrating the point. According to the study, which comprises of a comparison of seed variety availability in 1903 compared to 1983, 93% of the 1903 varieties had become extinct. I am not sure why this bothers me, but, it does. Enough scare mongering and down to the business of profiling these two great heirlooms. I find myself in a position that I have not previously been in… having to describe the characteristics of a tomato. There is a lot of pressure as I have built this tomato up so much, that, it may be hard for me to do it justice. An attractive, ribbed zucchini (I sound like I really “love” my zucchinis), Costata Romanesco really shines due to its firm, non-watery flesh. This makes it a versatile zucchini for cooking, lending itself particularly well to grilling, stir frying, frying, steaming as well as any other traditional cooking methods. I would describe the flesh as being sweetish, nutty, and, superior to other zucchini varieties I have tried. Additionally, they can be picked quite large and still retain a perfectly edible taste and texture. If you have never grown zucchinis before, they (zucchinis in general) have a reputation and almost a disdain among gardeners as supplying far too much fruit for one’s liking. Do yourself, friends and family a favour though, and add this variety to your summer crops. For those of you in Australia that I can sucker in to add a comment to this post… I have (or will have if I can’t find them), 5 lots of 10 Wapsipinicon Peach seeds to give away. Be one of the first 5 people to add an extremely friendly, positive and a maybe even a little sucky uppy (don’t mistake that for patronising though 😉 ) comment to this post score your sweet prize. I once read of a companion planting (planting crops which benefit each other together) concept known as “the three sisters”. Apparently a Native American form of companion planting . The concept is that Corn, Climbing Beans and Pumpkins/Squash are planted intermingled in the one bed. The beans climb up amongst the corn, and, the pumpkins trail along the ground. As well as being a great way to densely farm a bed, I am led to believe that the plants provide benefits for each other, but… I actually can not be bothered at the moment to fully research the benefits. What I can be bothered doing is providing a couple of pics of our current corn crop with the climbing beans growing amongst them. Should turn out being quite a productive and delicious little bed. Not sure if I am infringing on somebody’s copyright there… as I once saw a documentary of that name. I guess I agreed with the sentiment. Firstly, I guess the obligatory Merry Christmas is in order, as it happens to be Christmas Day. I have been taking the opportunity to potter around the yard, mainly to keep myself awake after an early start (I have a six year old child). Anyway, I have been trying to wait for a dry spell to harvest the garlic (I read once that it pays to do so), but, it is harvest time, so I went ahead and did it today anyway. Best served straight off the plants, and into ones mouth… the powdery mildew seems to have set in a little early this year. Normally I would try to fend it off with a milk spray, which is said to have good results, but… it only ever seems to prolong the inevitable. This year… I have decided to pick the plants bare and remove to make way for more crops. Below is some of the harvest… looks like snow peas on the plate for a while. I spray once mildew begins to come on (maybe that is too late? ), spraying the contaminated areas and the rest of the foliage as a preventative. Articles tend to suggest to spray every 10 days or so.